in Just Rs. 150/- per Sqft. Plot Area 1000 Sqft. - 11000 Sqft. Need a Home Loan to Buy Your Dream House? Get a loan sanctioned even before you select a property. Quick and easy processing for peace of mind. Loans at attractive interest rates making it easier on your pocket. How to know if you can cast vote? Your name must be on the electoral rolls in order to cast a vote. Using Elector’s Photo Identity Card (EPIC) number on your voter ID card, you can search for the name on the rolls. Another way to find out is by calling the helpline 1950. How to locate your parliament constituency and polling booth? Alternatively, you can also locate your polling booth by sending SMS. Type EPIC, followed by a space and your voter ID number and send it to 51969 or 166. You will receive a message with details of your polling booth within few minutes. How to know who is contesting from your constituency? A full list of candidate contesting in elections is available on the website of respective state election commissions. It provides access to the affidavits submitted by candidates that provides details about criminal cases against them, their assets, education and occupation. What if you don’t have a Voter ID card? You will be able to cast your vote as long as your name is present in electoral rolls. What happens inside the polling booth? First polling official will check your name on the voter list and check your ID proof. Then polling official will ink your finger, give you a slip and take your signature on a register. The voter will deposit the slip to another polling official and show your inked finger and then proceed to the polling booth. Record your vote by pressing the ballot button opposite to the symbol of the candidate of your choice on the EVM. You will hear a beep. Check the slip that appears in the transparent window of VVPAT machine. The slip with candidate serial no., name and symbol shall be visible for 7 seconds before it drops in the sealed VVPAT box. You can press NOTA, None Of The Above, if you don’t like any candidate; it’s the last button on EVM. Book your dream house before prices rise. Know the Answerer of the above, have to know about the Festival of Gudi Padwa. & Why Peoples Are Buying Home on this auspicious Occasions? Gudi Padva is a spring-time festival that marks the traditional new year for Hindus. It is celebrated in and near Maharashtra on the first day of the Chaitra month to mark the beginning of the New year according to the lunisolar Hindu calendar. Gudi Padwa, the most auspicious occasion. The festival symbolizes the start of New Year as well as the beginning of the spring season. No wonder it is one of the 3 ½ most auspicious days in the Indian Lunar calendar. There can’t be any better option to buy or book a home or land to celebrate and start a new year with new resolutions and new beginnings. Gudi Padwa is also the most awaited time for home-buyers looking at investing in property purchase for the first time rather than those who have been active in the market. “With an accelerated demand for affordable and premium projects and provisions such as conferring an infrastructure status to affordable projects. Customers have more sentiments and emotions attached towards property purchase as they are investing their life-Time savings into it. 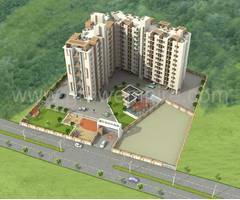 “They already make up their minds to book their dream home on Grate Occasion like Gudi Padwa. Buyers wait for Gudi Padwa, as they know that builders will come up with new schemes. Since it is a buyer's market, developers are coming up with new offers. This is for real. To boost the growth of the real-estate sector and make it a great reason for buying your dream houses. Many banks offer lower interest rates with many other offers like waiver on installments, easy EMI facilities, and waiver on processing fee and documentation fees. These discounts make a huge difference in the amount hence giving a chance to save it for the future. Along with the banks, even the builders and developers provide discounts on the rate of the houses. Either the rates are lowered according to sq.ft. or on all over price. Here is another way of saving a good amount of your saving which you have been doing it for over decades. Addition to this they also provide customized and easy payment schemes. Most of the homes are ready to move in. As Gudi Padwa is one of the few auspicious occasions according to Indian calendar, many builders have aimed at completing the construction before the occasion so that you can step in into the new home on the eve of New Year. This helps you to make a quick n good decision at a great price along with a huge amount of money saved. As many home Buyers are Looking to Booking New Property. Gudi Padwa is one of the few auspicious occasions. Many builders have aimed that Starting new construction on the occasion so that you can step in into the new home on the eve of New Year. Plots 7 lacs Per 1,000 sqft All Inc.
Grow Empire (www.growempire.com) is India's Leading Property Portal. Grow Empire provides a platform for property buyers/sellers to locate properties of interest and get quality information on the real estate space in a transparent and clear manner. Grow Empire helps in getting An Excellent Deal by helping you Buying, Selling, and Renting property all over India in a very simple manner. Post your Property for Buy/Sell/Rent on growempire.com & Get Quality and Genuine Leads. We will help you to fulfill your Requirement. Let's get started! IMPROVE YOUR BUSINESS Just Spend Few Minutes to Register. Hurry UP!!! Conserve, propagate & promote native trees for plantation & provide best help & guidance to customers. Build the largest collection of medicinal, fruit & rare plants across the nation.